Please click the link below to access a current list of jobs open at EPC Peterborough. We will update this list every Thursday afternoon, so check back often. If you are interested in applying to one of theses jobs call 705.748.9110, visit 418 Sheridan St or follow the instructions contained within the list (if applicable). Or visit our location at 418 Sheridan St. Formerly known as the Employment Planning & Youth Career Centre, our name has changed to better reflect the diversity of employment-related programs and services offered to all members of the community. Since our programs are supported by government employment, education and training initiatives, you can be assured that the programs we offer provide effective outcomes. Whether you choose just one program, or opt for a comprehensive range of programming and services, you'll see why we've been able to build a reputation based on quality. We offer access/referral to a wide variety of government-funded programs and resources to give both employers and individuals the employment edge. Please contact us at (705) 748-9110 for more detailed information and current list of government-funded programs and resources. Take a moment to review the sections on this page for more information on our programs and services, or contact us directly! We’re happy to answer any of your questions. Greater Peterborough Area Economic Development Corporation The Greater Peterborough Area Economic Development Corporation (GPA EDC) is a regional economic development organization contracted to provide investment attraction & expansion and tourism services for the City and County of Peterborough, Ontario. Worksearch A unique Site designed to help you through the process of looking for work. This page contains information for people who are interested in upgrading their skills, retraining or making educational choices. Jobs posted within the last 48 hours. The Workforce Development Board (WDB) Formerly known as the Kawartha Lakes Northumberland Haliburton Training Board. The Greater Peterborough Chamber of Commerce We know you will benefit from networking with us and our members. Peterborough and the Kawarthas Tourism Why we have chosen to live in the Kawarthas and why you might be interested in us. County of Peterborough The County is situated in the heart of the Kawarthas. The Peterborough Employment Resource Centre (PERC) Self-help centre which provides current resource materials, equipment and professional assistance from qualified staff to inddiduals conducting a self-directed job search. All of these services are provided at no cost to any member of the community and surrounding area. City of Peterborough More information is added to this site weekly and updates are made frequently. Lansdowne Place 645 Lansdowne Street West, Peterborough, Ontario. Work Info Net An Internet directory providing information on different aspects of the labour market. CKWF-FM - THE WOLF Welcome to the home of Central Ontario's Best Rock, THE WOLF 101.5 FM. fourinfo.com Database of Local Community Agencies and Volunteer Opportunities. Welcome Peterborough Information about the Peterborough area. New Canadians Centre (Peterborough) The New Canadians Centre is dedicated to supporting immigrants, refugees, and other newcomers. Please take a look around, and feel free to contact us. Everyone is welcome! PTBOCanada.com Volunteer Peterborough has lots of great opportunities for volunteering. Click the link for current volunteer positions where you can lend a helping hand. We believe immigrant integration is essential for long-term social, cultural, economic and environmental prosperity in our region. We exist to promote, advance and support coordinated immigrant integration in the Peterborough community. Employment Ontario We're Employment Ontario and we want to help you get the training, education, skills and experience to achieve your goals. Ministry of Training, Colleges and Universities Up to date information about education and training in Ontario. Job Futures Career resources site offers labour market information. Service Canada - National Site Offers information on Programs and Services. Canadian Careers Page Your guide to Canadian Online career information. CharityEmployers.com Canada's Home for Non Profit Jobs and Resources. Smart Serve Ontario Smart Serve Ontario has been developed to provide information about safe alcohol service at work and at home. Apprenticeships Employment Ontario-Ministry of Training, Colleges and Universities' website, provides a wealth of valuable information on apprenticeships in Ontario. Ontario Internship Program Initiative of the Ontario Government designed to help young people and recent graduated find jobs in public service. Contact Point A Canadian web site dedicated to the professional development needs of Career Counsellors. Career Edge A National Youth Internship Program. Career Paths Come along on a little time travel from the latest issue of career paths. Charity Village Charity Village is Canada's supersite for the non-profit sector. Passport to Safety A unique, not-for-profit, cross-Canada catalyst for change intended to help eliminate needless injuries and preventable deaths of young Canadians aged 24 and under. This site provides access to reputable and tested tools, models and frameworks. The tools found on this site have been reviewed to ensure they provide sound and practical advice for reducing stigma and managing mental health hazards in your workplace. We hope they allow you to implement a mental health program that protects the psychological well-being of your workers. The Ontario Civil Construction Careers Institute (OCCCI) Providing youth with insight into the Civil Construction industry and the many career opportunities that it provides, through increased public and government funding, knowledge and resources. TRIEC Campus TRIEC Campus is a free online learning hub offering self-paced resources designed to support team members and leaders in today's culturally diverse workplace. Resources cover effective communication and team-work as well as recruitment, selection and talent management practices to create workplaces inclusive of skilled immigrants. Stop Human Trafficing Durham Human trafficking is a crime and human rights abuse that’s sometimes called “modern day slavery.” Traffickers control people in many ways, including psychological manipulation, emotional abuse, lies, addiction, threats, violence, isolation, and taking control of ID/documents and money. City Of Peterborough Homelessness Services As of December 21, 2016 the Brock Mission Men's Emergency Shelter program temporarily relocated to 120 Murray Street (educational wing of St. Paul's Presbyterian Church) to allow for construction of their new building. Men needing emergency shelter should go to the new location at St. Paul's. Entrance is located off of Murray Street. City Of Peterborough Food Calendar The food calendar provides information about local food banks and free community meals in the City and County of Peterborough. Need People? We’ve got ‘em! Job Matching and Placement Services. Interview Assistance and Job Fairs. Online Job Posting and Social Marketing. And Access to Employment Related Resources. These FREE employment services can help you reduce the time and money spent on recruiting quality applicants. If you are licensed to operate in Ontario and provide employment in Ontario, then we want to talk to you! We work with small, medium and large business to support them in the hiring of a diversified and stable workforce. We can tailor our services to suit your business needs providing as much or as little support as you need. Give us a call at 705-748-9110 and we’d be happy to recommend the service that best suits your needs. EPC is a member of CERP, the Community Employment Resource Partnership. CERP maintains and promotes an online job board featuring Peterborough and Area employment opportunities. Simply fill out the job posting form by clicking here and one of our Employment Counsellors will upload your ad. As your local Employment Resource, EPC can help to connect you to resources that can be used to help offset the cost of hiring a new employee. Some of the clients who register with us are eligible for wage reimbursements and hiring incentives. We also administer youth-oriented programs to support summer hiring. Our Assisted Employment Services program is designed to help unemployed and underemployed individuals, as well as those working fewer than 20 hours a week, and part-time students. Some participants in this program are also eligible for financial assistance. Employers who hire these individuals may be eligible for wage reimbursements and/or hiring incentives. The $2,000 Apprenticeship Employment Signing Bonus encourages employers in the trades to register new apprentices in sectors where there is a high demand for skilled workers. Apprentices are required to be working with Employment Service Providers. The $1000 Apprenticeship Scholarship supports individuals who require upgrading to meet the registration standards for apprenticeship training. An individual must have an interest in apprenticeship, not have the necessary requirements for registering in the trade of choice and be able to achieve the necessary requirements within a year. The second installment of $500 is received when the individual has successfully completed upgrading, is employed and is registered as an apprentice. EPC oversees the delivery of two programs that provide incentives to employers interested in hiring a student or a young person looking to gain summer work experience. Check out the Students section for more information. The Employing Young Talent Incentive supports small businesses to hire and retain youth. Employment Service assisted youth are individuals between the ages of 15 and 29, who are unemployed, not participating in full-time training or education and legally entitled to work in Canada. Employers are eligible for up to $2000 ($1000 hiring incentive and an additional $1000 retention incentive after six months). 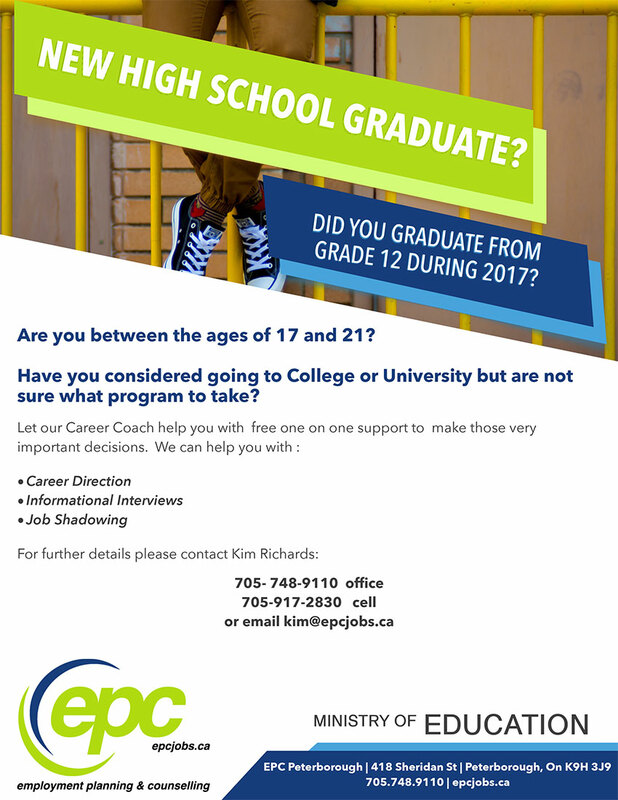 Please call 705.748.9110, visit 418 Sheridan St or click epcjobs.ca to get more information about the Employing Young Talent Incentive. Are you looking for new employees to help grow your business? Ontario's Youth Job Connection program can help. With the right opportunity and support from Youth Job Connection, young people can contribute to the success of your business. To make a referral or learn more, visit epcjobs.ca or call 1.705.748.9110 or visit the Resource Centre at 418 Sheridan Street Peterborough. COJG is a cost sharing grant between individual, employers and government designed to assist employers who wish to provide enhanced training to their employees. Employers under 99 employees get 2/3 of the training costs & employers over 100 employees get 1/2 of training costs to a maximum of $10,000 per trainee. Employers benefit by being able to offer their employees enhanced training that meets the needs of their workforce with the financial assistance from the government. Employees benefit from enhanced training by further developing their skills and solidifying their position in the workforce. Below is a list of potential training courses. EPC can assist you in finding the right training course/trainer for your staff. Looking to have a job fair? Let EPC host your next job fair! We have a centralized, downtown location available to employers for use FREE of charge. Looking to hire multiple people at once, or want to get the word out about your industry? We can help you plan and promote your event, collect and screen resumes, and we even help you with the interviewing process. Our Job Fair Team has a proven track record of success. Contact us today to get the ball rolling. Want a summer student? We’ve got ‘em! EPC is committed to helping connect students to local employers through our summer employment job board. For more information on this or other Employment Ontario programs and services or to register contact us! Want to post a student job online? Great! We can do that for you! EPC is a member of CERP, the Community Employment Resource Partnership. CERP maintains and promotes an online job board featuring Peterborough and Area employment opportunities. Simply fill out the student job form by clicking here and one of our Employment Counsellors will upload your ad. EPC offers professional and compassionate outplacement services when you’re in need. For more information on this or other EPC programs and services contact us! Take a moment to review the sections in this page for more information on our programs and services, or contact us directly! We’re here to help you with your job search! A resource centre with on-site Employment Counsellors, computers, a printer, fax machine and internet access, as well as a range of employment-related resources and information. One-on-One Employment Counselling to help you identify your goals and move towards realizing them. Skills and aptitude assessments to determine which jobs would be suited to you. Assessment of your eligibility and assistance applying for government funded programs like Apprenticeships, Second Career and more. Free Job Search, Interview and Resume workshops. Visit or contact EPC today to speak with an Employment Counsellor or fill out your online Job Search Profile and we will contact you within one business day to suggest programs and services. Laid off? Looking for Retraining? Additional support may be available to accommodate the needs of people with disabilities, who have costs related to dependent care, or to cover the costs of living away from home and academic upgrading. Second Career is for people who have had at least one lay-off since 2005, who are currently unemployed, and who would benefit from long-term skills training to transition them into highly-skilled occupations that are in demand in the local labour market. This includes laid-off workers who have taken an interim job to make ends meet. They will work with you to determine your best training option and help to prepare your application and plan of study. For more information on this or other Employment Ontario programs and services, contact us directly or fill out your EPC Job search Profile and we will contact you. 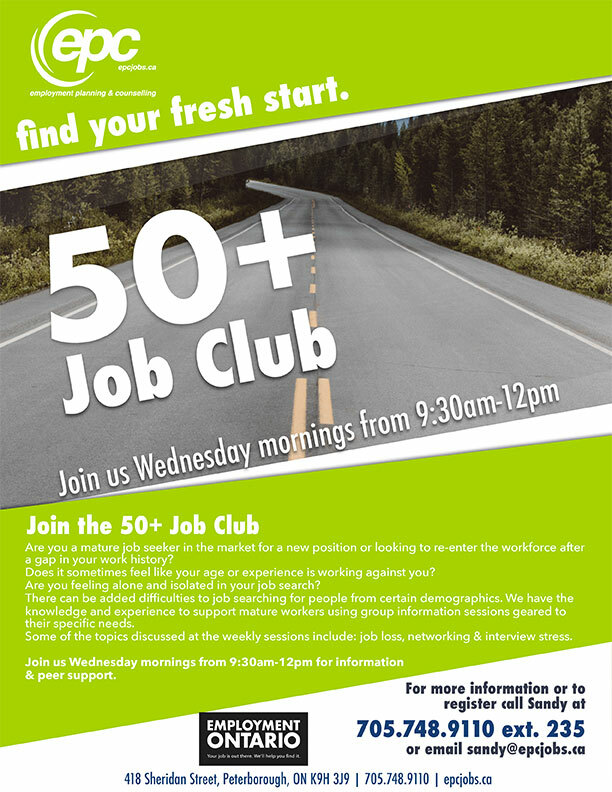 Are you a mature job seeker in the market for a new position or looking to re-enter the workforce after a gap in your work history?Does it sometimes feel like your age or experience is working against you?Are you feeling alone and isolated in your job search? Visit 418 Sheridan Street, call 705.748.91100 or click here to fillout your Job Search Profile and get help to find a job today. The Resource Centre has ten new computers with high-speed internet access, USB accessibility and Microsoft Office Suite 2010. We also offer free photocopying (limit of 10 pages per day), telephone access, and local and long distance faxing. On-site Employment Counsellors provide assistance with job search strategies, career selection, resume writing, information relating to the labour market and information regarding programs and eligibility criteria. Our in-house job board is updated weekly with jobs taken from general and local jobs search websites. We make sure the jobs we put on our board are local and we categorize them by industry, saving you time and energy as you continue your search for work. Not sure how to get started on your resume or cover letter? Come check out our many resume and cover letter samples. We have samples and templates for many different industries, so you’re bound to find a format that works for you. We also have print resources on commonly asked interview questions, how to do an information interview, job search strategies, as well as job search logs to help keep you organized. Currently there are no student job postings. Check back again soon!